Read here about the Skwish, the first commercially available children's toy that was a pure tensegrity. Marketing photograph of a Skwish. Created and copyrighted by Tom Flemons, currently produced under license by Manhattan Toys." link http://www.amazon.co.uk/Manhattan-Toy-Skwish-Classic/dp/B0000A1YXF"
I began working with tensegrity principles in the early 80's and built the first prototype of the Skwish in 1981. I named it the Sqhere (square sphere). In 1983 I hurt my back and was forced to turn a preoccupation into an occupation. By 1984 I was manufacturing tensegrity toys sculptures and mobiles full time. For the next 3 years I developed my company Intension Designs Ltd. and began to sell across Canada. At the same time I became interested in what later became the concept Biotensegrity and designed the first models of the spine as a Fuller mast. I began to sell these early models to doctors, chiropractors, and physiotherapists in Vancouver BC where I was living. I did a search of the medical literature and came across Dr. Stephen Levin's name but never had the time to find out what he was up to. 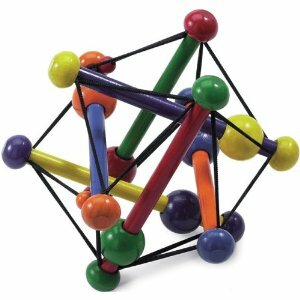 My toy company continued to expand slowly- it was difficult in the beginning because no one had ever seen a tensegrity before and parents were unsure if they were safe and interesting toys for their children, especially their babies. But by 1987 I had turned over the manufacturing end to a small toy company in Victoria BC named Pappa Gepettos Toys and focused on design. Over the next 10 years my tensegrity designs were manufactured in Victoria BC and marketed world wide. By 1997 when Pappa Gepettos sold their business to Manhattan Toys in Minnesota almost 2 million Skwish had been sold. Manhattan continued to sell my toys and by now well over 3 million Skwish toys have been sold. In 1999 I finally returned to research the application of tensegrity to vertebrate anatomy and tracked down Dr. Stephen Levin. We began to collaborate that year and have worked together for 11 years. Last year (Sept 09) we both attended the first ever conference on Biotensegrity held in St Malo France. It appears that Biotensegrity is now attracting increasing attention from researchers and clinicians in many fields. At present I am working on new tensegrity anatomical models and tensegrity sculptures. The price varied between $10 to $25, see graph. Manhattan Toy Skwish Manhattan Toy s postmodern take on the classic rattle, Skwish features numerous wooden rods attached to one another by a pliable elastic string offering maximum manipulation and fun. Appearing like a combination between a strand of DNA and a nautical star map, the design is both whimsical and engaging. Providing hours of entertainment, the toy develops logic reasoning, fine motor skill, hand-eye coordination, and understanding the principles of cause-and-effect. The smooth-textured Skwish Classic fascinates babies with its web of brightly coloured rods, beads, and balls. A fun, original and different Baby Rattle. Skwish Classic Rattle size 14 cms diameter. Suitable for Babies from 0 - 12 months old. This page was last edited on 18 January 2019, at 09:49.